I listened to this from an old recording narrated by John Polk. Harry Harrison died on August 15, 2012 at 87 years old. I decided to listen to The Stainless Steel Rat in his memory. Harry Harrison is one of the few writers who I would seek out and buy every book they produced. Harry never disappointed me. From The Stainless Steel Rat to Make Room! Make Room! to Bill the Galactic Hero to The Turing Option. I love them all and re-read many of them every couple of years. I think I am going to sprinkle in the rest of the Stainless Steel Rat series into my reading and listening over the next 6 months. DiGriz is caught during one of his crimes and recruited into the Special Corps. Boring, routine desk work during his probationary period results in his discovering that someone is building a battleship, thinly disguised as an industrial vessel. In the peaceful League no one has battleships anymore, so the builder of this one would be unstoppable. DiGriz’ hunt for the guilty becomes a personal battle between himself and the beautiful but deadly Angelina, who his planning a coup on one of the feudal worlds. DiGriz’ dilemma is whether he will turn Angelina over to the Special Corps, or join with her, since he has fallen in love with her. ©2010 Harry Harrison (P)2010 Brilliance Audio, Inc. I rate this book a 10 out of 10 for lovers of humorous science fiction. I bought this audiobook from Audible. I got this book because Wil Wheaton narrates it and it is rated extremely high on the Audible.com web site; there are not many books that are rated so high, 4.5 stars in "Overall," "Performance," and "Story," with around 500 total reviews. I like that Wil Wheaton narrated this story. I was surprised to learn how many books he has narrated, 18 of them currently listed on Audible. But I feel that his performance did not really bring the story to life, it left me kind of flat. The story is a good one though, full of humor, politics, and action. It was a fun read that I would have listened to in one sitting if I had the time. I look forward reading more John Scalzi books, I have my eye on Fuzzy Nation. A human diplomat creates an interstellar incident when he kills an alien diplomat in a most unusual way. To avoid war, Earth’s government must find an equally unusual object: A type of sheep ("The Android’s Dream"), used in the alien race’s coronation ceremony. To keep our planet from being enslaved, Harry will have to pull off the greatest diplomatic coup in history, a grand gambit that will take him from the halls of power to the lava-strewn battlefields of alien worlds. There’s only one chance to get it right, to save the life of Robin Baker – and to protect the future of humanity. &copy2006 John Scalzi (P)2010 Audible, Inc. I rate this book an 8 out of 10, a very good read for lovers of humorous science fiction. I bought this book from Amazon after reading a blog post by Jeff Atwood. Jeff does not mention this book in his post; he talks about the book “How to Talk So Kids Will Listen & Listen So Kids Will Talk” by Adele Faber; which is based upon the research and lessons taught in the P.E.T book. So after reading the post I bought copies of both books and the P.E.T. book is the one I chose to read first. 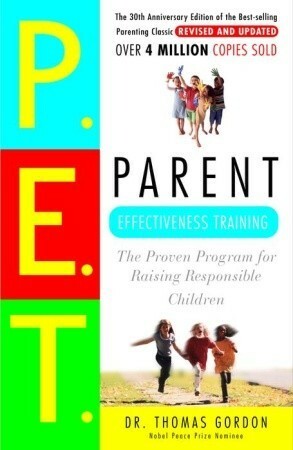 Parent Effectiveness Training: The Proven Program for Raising Responsible Children is a fairly technical book, it tries hard not to be, but I feel like it is. The book focuses on two techniques that are effective ways to communicate and work with everyone around you, no matter your relationship or age difference. The first technique is Active Listening. I believe correctly applying active listening to your daily communications is great, I think it helps open up others to really talk to you and to create a deeper understanding of what is being discussed. To me active listening means really listening to the person and then telling them what it is I heard them say in my own words. It is not parroting what they said back to them or rephrasing what they said, it is more about making sure that you both are on the same page and letting them know that you really heard what they are trying to communicate. It is a lot deeper than that, but that covers what I see as the basics. The second technique is the “No-Lose” method of conflict resolution. This one is much harder to describe in a single paragraph, but the basics are working together to find a single solution that makes both parties happy. It is not another name for compromising, but actually looking for a good solution where everyone wins. Big stuff there, I am not sure I understand it well enough to describe it well, but I hope I am able to put it into practice with my child and everyone else. Using the timeless methods of P.E.T. will have immediate results: less fighting, fewer tantrums and lies, no need for punishment. Whether you have a toddler striking out for independence or a teenager who has already started rebelling, you’ll find P.E.T. a compassionate, effective way to instill responsibility and create a nurturing family environment in which your child will thrive. I rate this book an 8 out of 10 and recommend it for any parent. I read this book as a PDF bought from O’Reily Media’s Safari Books Online mostly using an iPad and iBooks but also using the Preview app on a MacBook Pro. I really dislike showing any photographs without the minimum of rotate, crop, exposure correct, color correct, and export at the needed sizes and Lightroom allows me to do that very quickly. I have been using Lightroom since the beta of Lightroom 3 and I read Scott Kelby’s version of this book back then. I loved the book and Lightroom so much that I lent the book out until it didn’t come back, and that’s ok, I like to think that it is still floating out there somewhere being read by a photographer that has been stuck using some antiquated tools to manage and edit their photos. This book for version 4 is a lot like the one for version 3, but it is well worth the read as many new chapters have been added and Lightroom 4 has enough new features and behaviors that the new book is a great help for getting the most from it. Scott does a great job pointing out the places that Lightroom 4 differs from previous versions but doesn’t dwell on those differences to the point that a person just starting out with version 4 would be distracted by them. The only content in the book that I found not useful is the chapter pages, I would prefer that Scott went back to being funny or leaving the space blank. I like the workflow that Scott covers in the book with the exception of using collections. I prefer to not use collections because they are only internal to the Lightroom database, I prefer to have my files organized in the computers file system so that I will be able to easily find them if I stop using Lightroom one day. Remove the memory card from the camera and use a card reader to get the images into the computer. My file structure looks like “Dave Import / 2012 / 20120725_eli-playground” which is “my import/year/yyyymmdd_name-of-event” then when I export I use the same structure but begin with “Dave Export”. Import the images into Lightroom adding my IPTC copyright information along with generic keywords from the shoot. Quickly look through all of the images and identify obvious rejects by flagging them by typing “x” which identifies them as rejects and get an overall feel for them. Now I take a break, at least 15 minutes long. This allows my thought about the images to gel and take shape. Upon coming back I will use “Flags” to identify the photos I never want to see again by typing “x” which marks them as rejected, and “p” which marks them as a pick. Photos that do not get a flag are kept, but they do not get exported. Then I delete all of the rejected photos, from the Lightroom database and also from the hard drive. Now I use “Filters” to work with just the picks and I switch to the “Develop” module. In the develop module I work my way through the images using the techniques that Scott covers in his book. Many images that were marked as picks may become not-picked or even rejected based on the results of being edited. Now that all of the picks are edited I add captions that describe each image and keywords that can be used to search for each image. This takes a long time and a lot of thought, but it is also what will make your images valuable in the future, if you cannot find a photo you cannot sell that photo. Then I export the picks as original size JPGs with an sRGB colorspace and my naming convention of “dave-nelson-20120725-112317-0001.jpg” which is “my-name-yyyymmdd-hhmmss-####.jpg”. At my SmugMug web site I create a new gallery giving it a name, caption, and pricing list then use MacDaddy to upload the exported images to that directory. Lastly I send out emails and post on various web sites that I have some new photos available for viewing and purchase. This particular process has worked well for me but it has been tweaked many times over the years. Also keep in mind that I am a hobbiest photographer and that the money I do make from photography does not come close to paying for itself. I rate this book a 9 out of 10 and a must read for anyone interested in using Lightroom to manage and edit photographs. Posted in Books, Computers, Photography, Software.